April 25, 2012 9:30 A.M. The government's March 27, 2012 Budget took strong action to eliminate the deficit while protecting the health and education services families rely on most. Balancing the budget is also essential for economic growth and job creation. 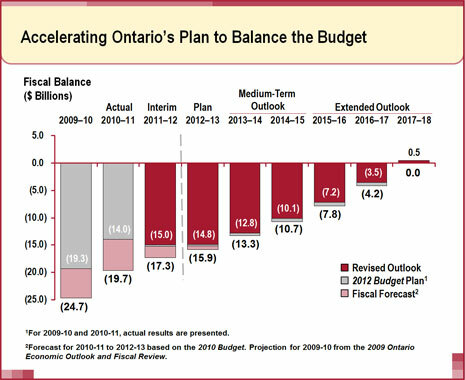 Ontario's deficit in 2011-12 is now projected to be $15.0 billion, an improvement of $0.3 billion compared to the projection outlined in the 2012 Budget. All of the additional revenue from the proposed temporary Deficit-Fighting High-Income Tax Bracket would be used to decrease the deficit and accelerate Ontario's plan to eliminate the deficit by 2017-18. Provincial deficits are now projected to be lower than forecast in the 2012 Budget in each year between 2011-12 and 2016-17. The government is now projecting a $0.5 billion surplus in 2017-18. Provincial debt, measured as the accumulated deficit, would be reduced by $3.5 billion by 2017-18. Proposed changes include no net new spending, and as a result, the Province's expense outlook remains unchanged from the 2012 Budget. 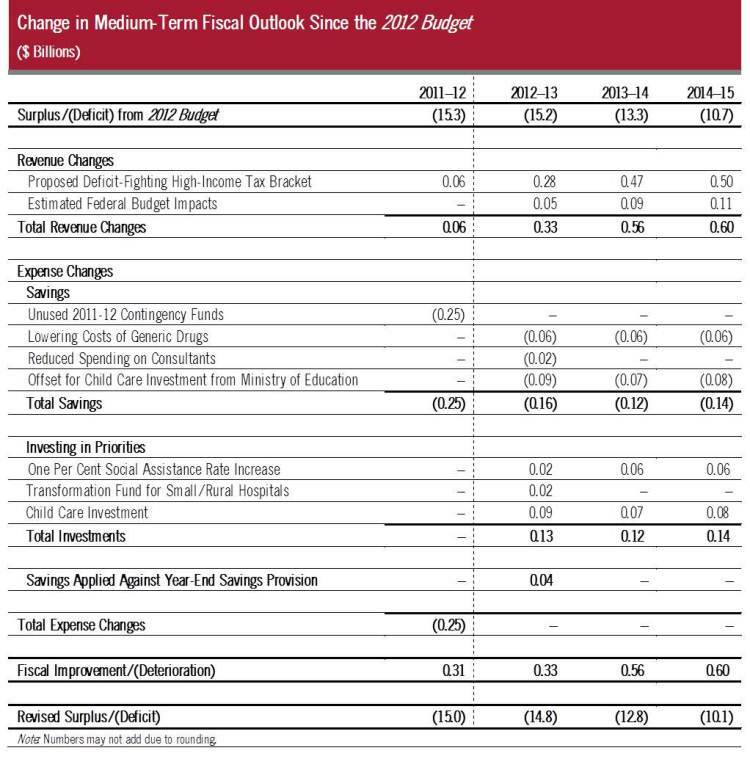 The interim results for 2011-12 published in the 2012 Budget were based on information available as of early March 2012. Since that time, additional information has become available that projects a further improvement in the Province's expected 2011-12 fiscal results. The government now projects a deficit of $15.0 billion in 2011-12, an improvement of $0.3 billion compared to the 2012 Budget projection and $1.3 billion lower than the 2011 Budget forecast. The projected improvement in 2011-12 is a result of a revenue increase of $55 million arising from the proposed temporary Deficit-Fighting High-Income Tax Bracket which would apply throughout 2012 at 12.16 per cent (one-half of the increase in the rate). Furthermore, the remaining $250 million in contingency funds included in the 2012 Budget were not required by year-end, and as a result, are being used to reduce the deficit. Further information on 2011-12 actual results will be presented in the 2011-12 Public Accounts, released later this year. The government is now projecting lower deficits than originally outlined in the 2012 Budget. Over the medium term, the government is now projecting deficits of $14.8 billion in 2012-13, $12.8 billion in 2013-14 and $10.1 billion in 2014-15. The forecast for Ontario revenues has increased by $333 million in 2012-13, growing to $600 million by 2014-15, above the projections outlined in the 2012 Budget. The government is proposing to introduce legislation to create a temporary new Deficit-Fighting High-Income Tax Bracket for individuals earning more than $500,000 annually. Subject to the approval of the Legislature, the top statutory Ontario income tax rate on taxable incomes over $500,000 will increase by two percentage points, from 11.16 per cent to 13.16 per cent. This change would generate additional revenue of $280 million in 2012-13, $470 million in 2013-14, and $495 million in 2014­-15. All of the additional revenue raised by this proposed measure would be used to reduce the Provincial deficit and accelerate Ontario's plan to eliminate the deficit by 2017-18. The new tax bracket would be eliminated once the budget is balanced by 2017-18. The federal budget was released on March 29, 2012, two days after the release of the 2012 Ontario Budget. The federal budget proposed a number of tax changes that Ontario automatically parallels under federal-provincial taxation agreements - such as including employer contributions to group sickness or accident insurance plans in the income of an employee, and new international taxation and anti-avoidance rules. Together, these federal tax changes are projected to increase Ontario revenues by $53 million in 2012-13, $93 million in 2013-14, and $105 million in 2014-15. All of the additional Provincial revenue resulting from these federal changes will be used to reduce the Provincial deficit. The following changes to the Province's expense outlook are being made to enhance the budget and contain no net new spending. In 2010, Ontario lowered the cost of generic drugs paid for by the Trillium Drug Benefit and Ontario Drug Benefit to 25 per cent of the cost of the brand product. The government will move immediately to lower the cost of the top 10 generic drugs from 25 per cent of the comparable brand-name product to 20 per cent. This change will generate an additional $55 million a year in savings. Between 2002-03 and 2011-12, Ontario reduced spending on consultants by about 45 per cent. The government is committed to further reducing spending on consultants by $20 million in 2012-13. The government will redirect savings to support other important priorities without any overall change to Provincial expense. The government is investing an additional $90 million in 2012-13, $68 million in 2013-14, and $84 million in 2014-15 to ensure the child care sector remains strong and can help families experience a seamless transition to full-day kindergarten. This investment will be funded from within the Ministry of Education's allocation published in the 2012 Budget. The government is increasing Ontario Disability Support Program and Ontario Works rates by one per cent in the fall of 2012. This initiative will provide about $55 million annually in additional benefits to families and individuals receiving social assistance. The government will make a one-time investment of $20 million in 2012-13 to help 55 small and rural hospitals improve patient care and transform their organizations. Similar to previous years, the 2012-13 Budget plan included an $800 million year-end savings provision in recognition of savings anticipated to arise within the fiscal year. The expense changes highlighted above generate net savings of $35 million in 2012-13, which will be applied against this provision. Further details on the medium-term fiscal plan will be provided in future fiscal updates. The 2012 Budget outlined the government's plan to eliminate the deficit and balance the budget by 2017-18. As a result of additional revenue outlined above, and by not increasing overall spending, the Province's deficits are now projected to be lower than the 2012 Budget each year between 2011-12 and 2016-17. The government is also now projecting a $0.5 billion surplus in 2017-18. Taken together, these proposed actions and measures will accelerate Ontario's plan to eliminate the deficit and reduce Provincial debt. As measured by the accumulated deficit, the Provincial debt will be reduced by $3.5 billion by 2017-18.